This is the third month of the food preservation Mastery Challenge hosted by Marisa McClellan at Food in Jars. March’s challenge is a choice of Jellies and/or Shrubs. Always one to try something new, I decided to explore shrubs. What’s a shrub, you might ask? At least, what is it when we’re not talking about the woody plants growing around the foundation of your house? Shrub is sometimes known as drinking vinegar. It’s a sweet and tart syrup made with fruit, sugar, and vinegar. Other herbs, spices or aromatics can also be added. Typically, a shrub is added to seltzer water for a refreshing drink or, with some added alcohol, a cocktail. I like getting familiar with a new way to preserve fruit that’s an alternative to jellies and jams. 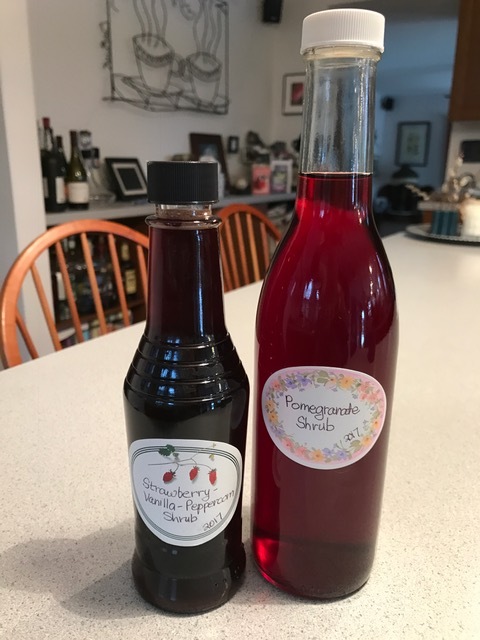 The first shrub I made was Pomegranate Shrub. I had half a bottle of Pom pomegranate juice in the fridge, so I tried one-third of a batch of this recipe from Punch Drunk. It was super simple. All you need to do is combine juice, sugar, and vinegar. I heated the vinegar first to accelerate the dissolving of the sugar, then added the juice. Pomegranate is tart to begin with, so the vinegar enhanced the tartness, which was toned down by the sugar. My second attempt was a bit more experimental. I started with strawberries I had frozen after a summer berry picking outing. After reading about the different processes, I opted to start with the hot method, where the fruit is infused in simple syrup to extract its juice. I added slightly thawed berries along with some crushed peppercorns to a warm simple syrup and simmered it. Then, I strained out the fruit and added vinegar and some vanilla extract for good measure. This Strawberry-Vanilla-Peppercorn Shrub reminded me of summer. The berry flavor was pronounced, the vinegar added some tang, and the other flavors gave it some mystique. Shrubs are a worthwhile discovery! Both shrubs were delicious added to seltzer. I still have to try adding this to cocktails. 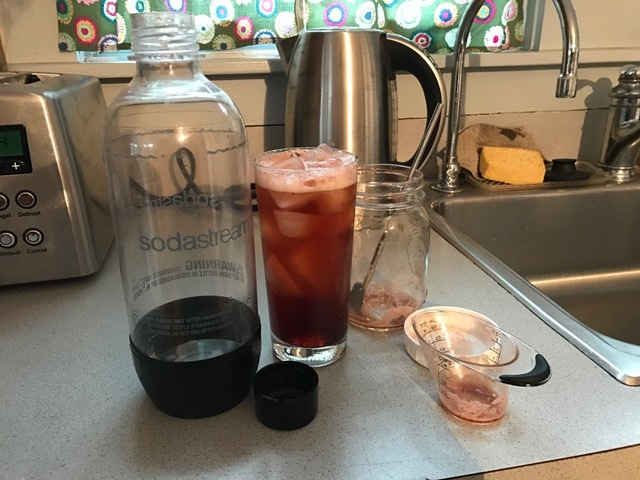 After I’ve gone overboard picking fruit this summer, I’m also interested in trying the cold method for making shrubs where fruit is simply tossed with sugar to draw out its juice before adding the vinegar. Heat the water in medium saucepan over medium heat. Add the sugar and stir to dissolve completely. (If you already have simple syrup on hand, gently heat ¾ cup simple syrup in the medium saucepan instead of dissolving sugar in water.) Add the strawberries and crushed peppercorns, and bring to a light simmer. Cook for about 10 minutes, until the syrup is a rich color and the strawberries are soft. Let the fruit cool in the syrup until lukewarm. Strain the berries from the syrup. (No need to discard the strained berries. Stir it into yogurt for breakfast or a snack.) Stir the vinegar and vanilla into the syrup. Transfer to a bottle. Store in the refrigerator. This year, I’m participating a Mastery Challenge of food preservation hosted by Marisa McClellan at Food in Jars. The challenge for February, the second month, is Salt Preserving. There were so many different avenues to explore in this category. I decided to focus on this technique for extending the lifespan of herbs. While February is not the ideal month for fresh herbs in the garden, it is still a good month to practice with store-bought herbs in anticipation of the summer season. My first experiment was Salamoia Bolognese. I’d read about this Italian herb salt on You Grow Girl a while back, so this was the perfect opportunity to put it into action. I followed Guyla’s recipe more-or-less. I hand-chopped the sage and rosemary, chopped the garlic in a mini-chopper, and took the liberty of adding peppercorns which confined in a ziplock bag and whacked with a rolling pin to crack them. 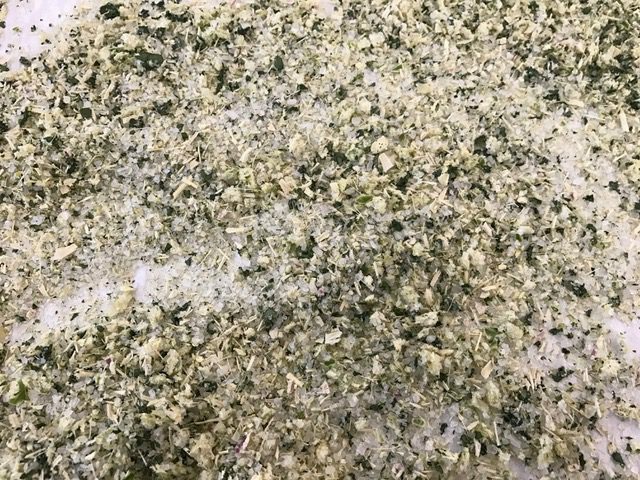 The mixture is spread on a baking sheet for a couple of days while the salt dehydrates the moisture from the herbs and garlic. I sometimes wish that blogs came with “scratch-and-sniff”. While the mixture did its magic, it smelled fabulous every time I walked by. I also used this mastery challenge as an excuse to make The River Cottage’s Vegetable Bouillon, another recipe I’ve been wanting to try. The food processor made quick work of chopping the vegetables and herbs. Again, the fragrance was enticing. This mixture of salt, celery root, carrots, fennel, and leek, along with cilantro and parsley, is packed into jars that are refrigerated or frozen. A spoonful added to a cup of boiling water makes a cup of vegetable bouillon. I used several spoonfuls to make vegetable stock I used in a roasted carrot soup. I ended up with more jars than I need for the foreseeable future so I shared some, put one in the fridge, and a couple in the freezer for later. 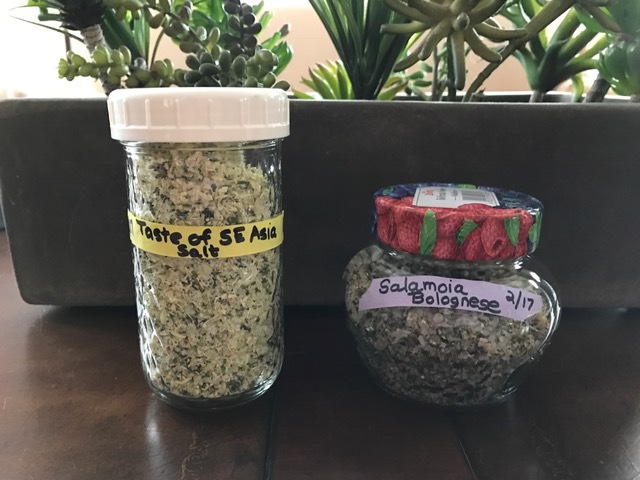 My final experiment builds on the Italian herb salt. 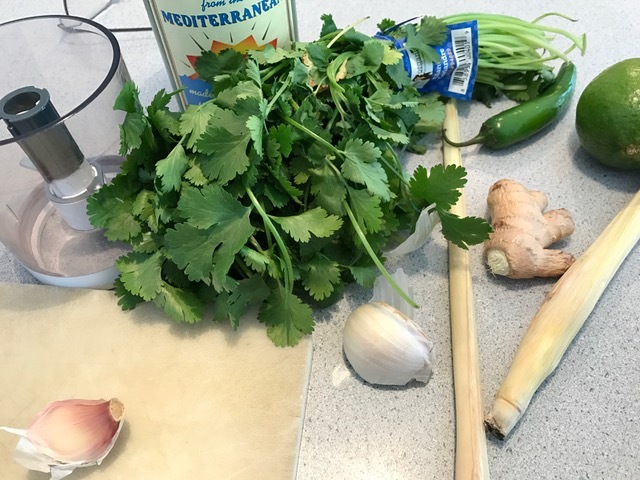 After finding some stalks of lemongrass in my vegetable drawer, I decided to invent a Southeast Asian herb salt from garlic, ginger, lemongrass, serrano pepper, lime zest, and cilantro. I combined all the ingredients with a healthy dose of coarse salt and left it out to dry for a few days. This salt smelled even more amazing than the original version. Because there was a higher ration of moist ingredients than the Italian version, it took a little longer to feel dry. After the first day, I felt impatient, so I let the herby salt spend an hour in the oven on the Dehydrate setting (120F) which accelerated the process. After another day at room temperature, it was ready to pack into a jar. I really enjoyed these projects. Now I’m excited about the combinations I can dream up during the summer when my prolific back-door herb garden cries to be used. Holiday food gifts in the making! Line a baking sheet with parchment paper. Spread the salt mixture evenly on the baking sheet. Let it sit at room temperature for 48-72 hours until it feels relatively dry to the touch. If you are worried about dust or pet hair, mostly cover the sheet with an upside-down baking sheet of similar size. Don’t cover completely because the moisture needs a way to escape. When ready, if the salt seems clumpy (mine did), transfer it to a bowl and lightly break it up with your hands before transferring to a jar.